Having struck out on the first couple of places we intended to try last night, we didn’t have high hopes for Drelyse being open either. They clearly weren’t, going by the signage on the door, but the door wasn’t locked and people were inside so we thought we’d grab a to-go menu and continue on. Sayid, the (co? )owner and husband of the chef, wasn’t going to let us go so easily. Clocking us for first-timers we were, he graciously invited us to sit and promised to feed us the ‘best African food in the city’. We started off with some small bite ($1.00 each) sambusas, vitumbua, and a nem spring roll. The sambusas (triangular pockets filled with beef and spice) were wrapped in a thin phyllo-like shell that was nicely fried. The spicing was minimal, leaving the experience to be that of the crunch of the shell and the flavor of ground beef. 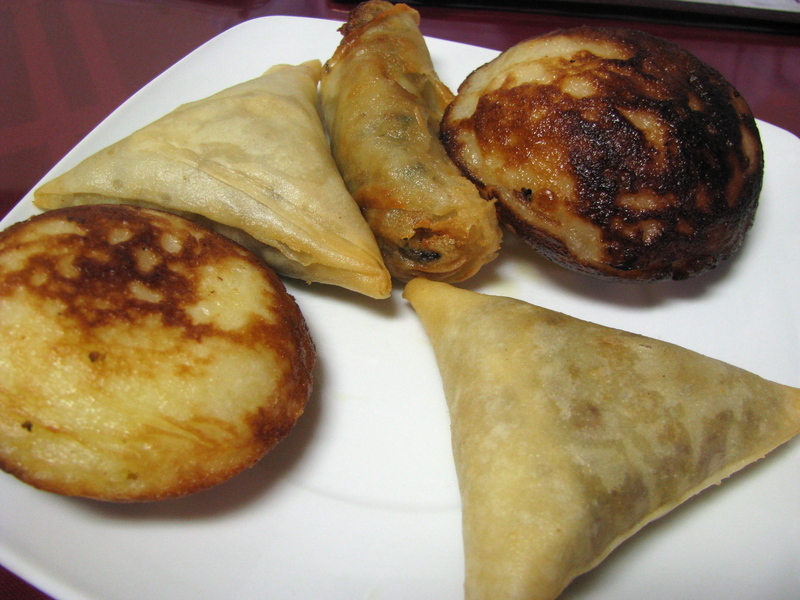 The vitumbua was more interesting – this traditionally Tanzanian breakfast food is something of a thick, bread-like rice patty made with coconut milk. Flavor was subtle when eaten alone – toasted crust of the exterior and just a hint of sweetness from the coconut were the main impressions – but when paired with the provided hot sauce it came into its own. The nem was our favorite of the three and we wished we had ordered more than one. I believe they were made with pork and shrimp and seemed more Asian than African. They were really succulent and needed no accompaniment. We were also given a taste of the beef peanut butter soup which was extremely hot (spice) with an intensely meaty broth. As we finished these, our mains appeared – jollof rice with goat, okro (okra) stew with banku, and waakye (rice & beans) with chicken. 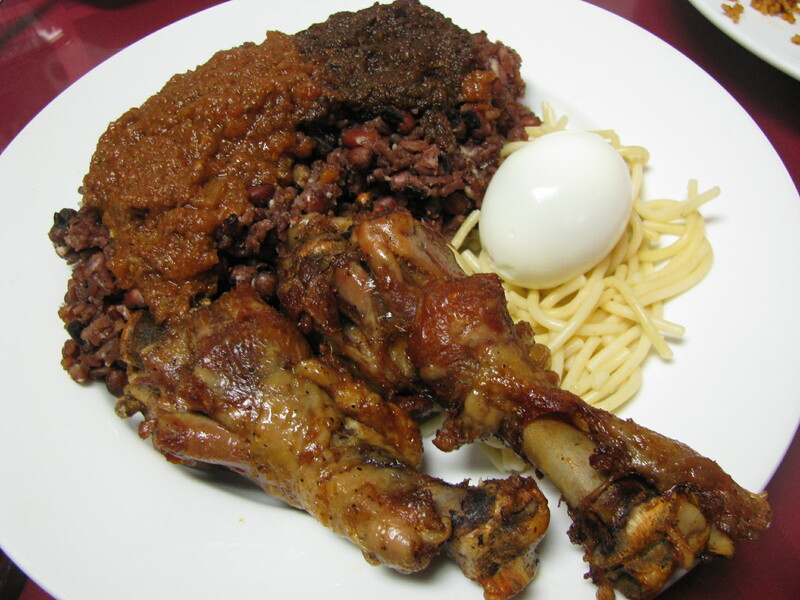 Waakye (pronounced watch-EH), we are told, is the national dish of Ghana. It’s little more than rice and beans, and if our experience is any indication, comes to life based upon the sauces atop it. The reddish sauce was similar to what came with the vitumbua. The darker sauce was fascinating – it had a mild fishiness from crayfish, a bit of a nuttiness, and finished with a spicy bite. It made the dish for me. The chicken was what you’d hope for from a carefully prepared grilled chicken, and the hard boiled egg and pasta garnish were entirely as expected. 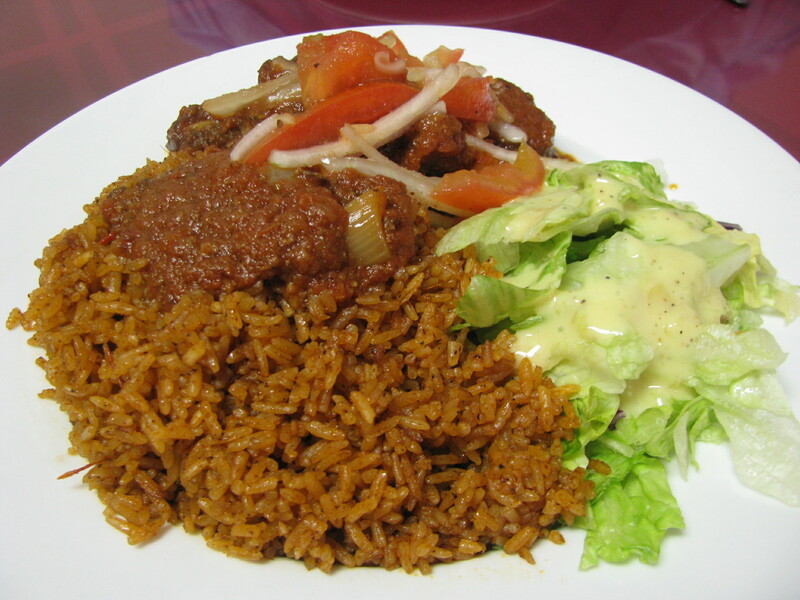 The jolof rice was a potently seasoned concoction – red pepper for sure, and more herbs and spices beyond that than I could even begin to discern. Cooked with tomato, tomato paste, and sauteed onions, this was a pleaser. The goat, served on-the-bone, was tender and flavorful. We tore off a few pieces, and used them to pinch a few morsels out of the stew. Or, at least we tried to. Let me pause for a moment, and reflect on the word mucilaginous, as it is a common characteristic of some African okra dishes. It, stripped of elaboration, basically means gooey. In this case, very gooey – slimy, actually. It also meant that the okra dish resisted the banku in the same way that oil resists water. Our server looked on, amused, as our pinching motions squirted hunks of beef across the bowl. Defeated, we reluctantly returned to forks and spoons… only to feel the sting of defeat once again. Beyond the okra, though, we found the meal to be quite satisfying. Governor Strickland feels similarly, and has used Drelyse as a caterer for events at his mansion. Drelyse has a significant vegetarian offering – covered in more depth here – and service is extravagantly attentive. Also worth noting – Drelyse is planning to open its patio soon. Expect kebabs and other grilled dishes once this happens. 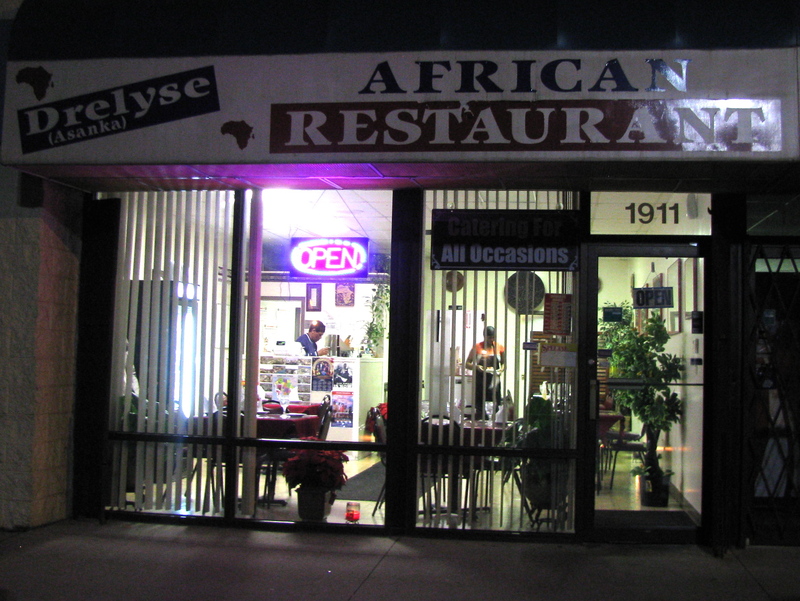 We had no idea that Columbus had a Senegalese restaurant – not from our research (which deemed it, somewhat generically, a ‘West African’ restaurant), and not from Dabakh’s exterior signage, which spoke of ‘African-American’ cuisine. But Senegalese it is, and exuberantly so. The building obviously started life as a fast food restaurant of some sort (Wendy’s? Rax?) but has been given a thorough going-over. 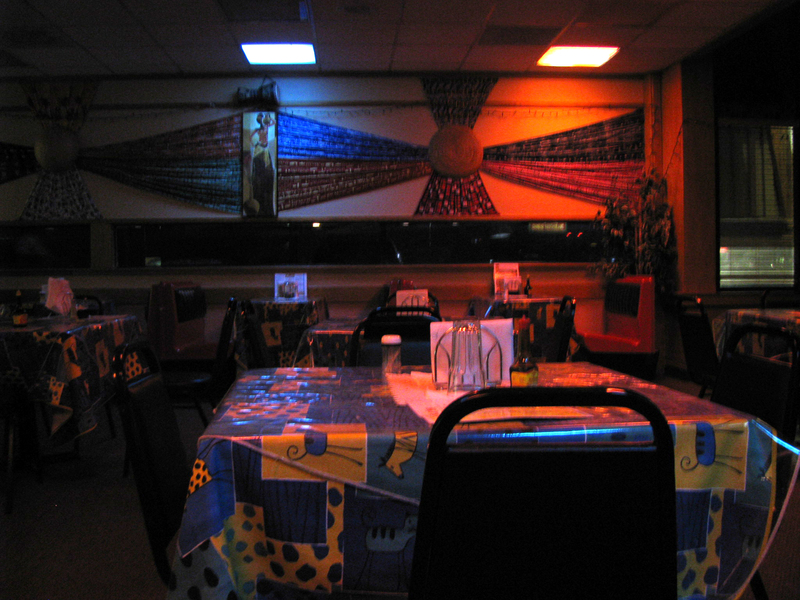 Vibrant fabrics and Senegalese handicrafts adorn the walls and tables in the dining areas, and the fluorescent ceiling lights were covered with colored gels. The effect is somewhat psychedelic, and, at least at night, quite dark. Ordering occurs as one would expect from the fast-food layout, at a counter and from several menu boards scattered about. 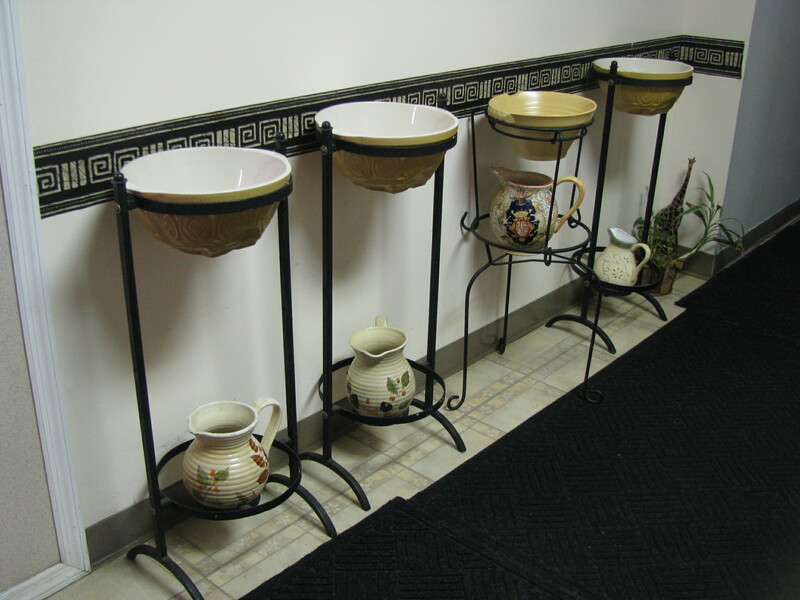 The employees manning the counter are friendly and eager to answer questions and explain dishes. We recommend quizzing them to your hearts content – though the English descriptions are serviceable, there is much be to gained from discussion. After conversation, we settled on dibbi (Grilled lamb with a side) and maffe (lamb and vegetables in a peanut butter sauce) as well as a selection of Senegalese beverages. The maffe came out first. I did. And then had more. It was good. Our preconceptions about peanut butter threw us for a loop – this is a resolutely savory dish. The peanut imparted very little sweetness, and was well balanced by the tomato component and a bit of spicy heat. The lamb was bone-on and very tender, and the veggies (carrots and potatoes, to the best of our ability to discern) were a minor presence. The sauce was the star, though, and we found ourselves ladling it over the rice and sopping it up with the complimentary french bread. Next came the dibbi – in staggering quantities. There’s easily a pound of grilled lamb on that plate. Seasoned with salt, pepper, and a ‘cajun spice’, the flavor was quite nice. Unfortunately, it was a bit overdone for our tastes, though still enjoyable (we took about half home with us and reheated it for lunch today). 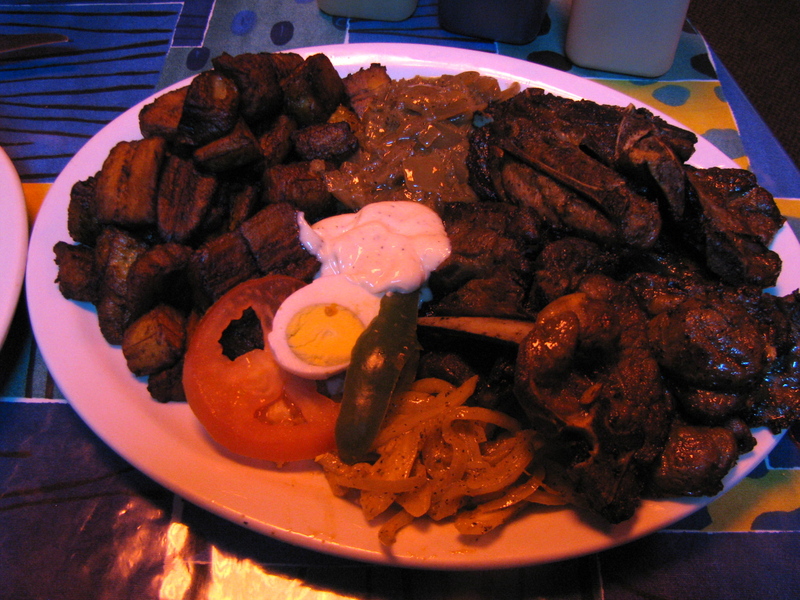 The dibbi came with sweet plantains (a bit greasy), two kinds of marinated onions, half a hard boiled egg, and a slice of tomato and green pepper. Dabakh makes their own Senegalese beverages, and we tried their bissap (sorrel juice), ginger (no translation necessary), and bouye (juice made from the fruit of the baobab). The Bissap, to be honest, smelled like a fruity Listerine and tastes like a sweet cherry juice… spiked with Listerine. Ginger – Potent stuff! Excellent for sinus decongestion, or could be good if diluted. Bouye – this gets interesting. Rich, slightly creamy, and a bit tart, bouye reminded us of the flavor of jackfruit. Not too sweet, entirely refreshing. While the bissap and ginger bottles linger in our refrigerator, the bouye disappeared quickly with dinner. 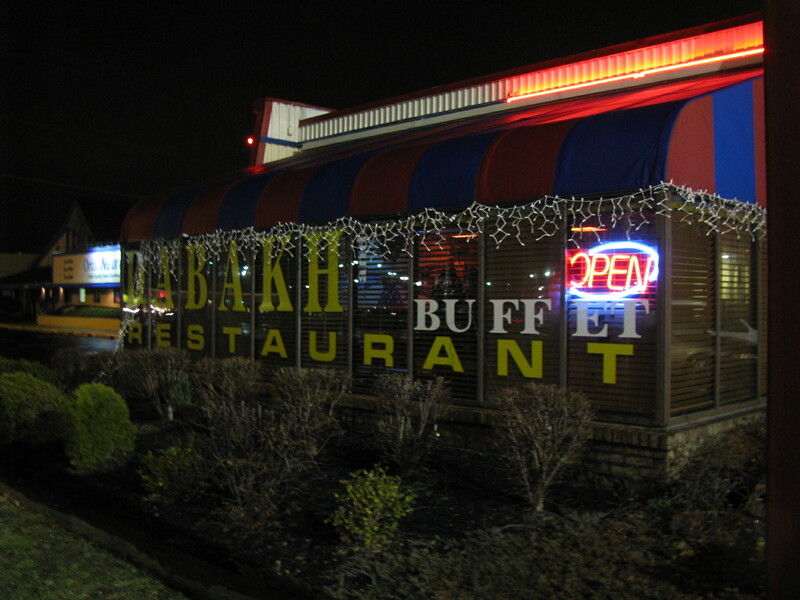 Dabakh, now open for a year, is said to do good lunch business. All lunch offerings are $7, and all dinners are $10 (unless otherwise noted). All preparations are halal. 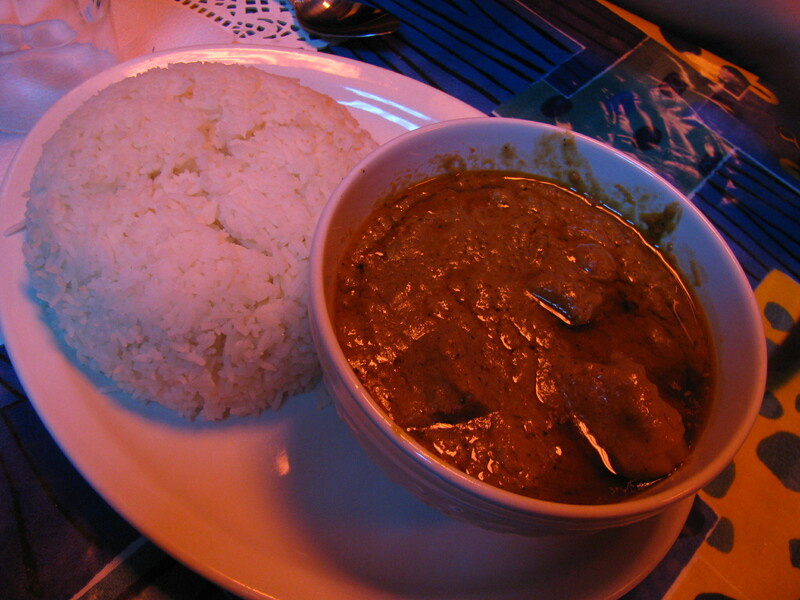 Should you want a primer on Senegalese cuisine, this link provides a good overview.